Who didn’t see it coming? If you witnessed Tal Wilkenfeld in concert with Jeff Beck in the past couple of years and thought of her as the bass player, you were only partly right. Yes, Wilkenfeld is a remarkably solid bassist who brings some serious jazz-fusion chops to the rock stage. But to dismiss her as a perpetual member of anybody’s rhythm section is to be mistaken. Wednesday, November 15, 2017, 8 p.m. It was only a matter of time before the attention-getting bassist/guitarist/singer headlined her own tour. Out now in support of her first single, “Corner Painter,” Wilkenfeld’s on her own dime and looking to crowd-source some coin to finish the album. Relentless is a word many use to describe the Australian’s rise from obscurity to becoming an in-demand side-woman. 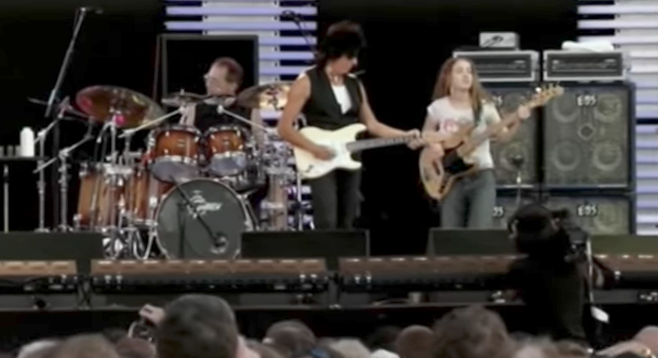 Since breaking out of jams in New York clubs with a surprise invitation to play with the Allman Brothers band in 2006 (which she turned into the gig with Jeff Beck), Wilkenfeld has recorded with a range of artists that includes Herbie Hancock, Prince, Ringo, Keith Urban, and Macy Gray. She has gigged with Buddy Guy, Pharrell, Ben Harper, and Billy Gibbons — it’s a list that goes on and on. Wilkenfeld is a high-school dropout from Sydney. She made her way to America, gave up the acoustic guitar she’d learned on for an electric model, then switched to electric bass. She finished her education at a Los Angeles area academy of music, then traded the West Coast for the East and put her effort into gaining stage time in New York jazz clubs. It’s the time-honored way. Now 30, the show Wilkenfeld’s touring at present is way less electric-bass-guitar prodigy and way more singer/songwriter. Both sides of the woman’s musical persona are borderline brilliant, but the audience will decide which one will pass the test of time.